The purpose of this E-Book is to address advanced topics of Electromagnetic Interference (EMI) in modern power electronics and power systems. This book aims at practicing engineers and graduate students and will be of immense help to them while analyzsing EMI problems in electrical and electronic systems. This E-Book focuses on conducted and radiated emission noise generated by different power converters such as Switch Mode Power Supplies and DC-AC Converters. EMI filter design and different approaches to predict common mode and differential mode noise are discussed in detail. One of the challenging issues in power converters is the thermal problem due to heat generated by switching devices. In this E-book, the effects of heatsink on conducted and radiated noise have been taken into account. Common mode and surge voltage issues in AC machines have also been addressed and discussed in this E-book. This E-book consists of five chapters which address different EMI issues in power electronics and power systems. The chapters of this E-Book are written by eminent researchers and engineers. I had a great pleasure reading their material and would like to congratulate all the authors for their excellent contributions. Overall, this E-book addresses the most important electromagnetic interferences issues in Power Electronics and Power Systems. The purpose of this E-Book is to address advanced topics of Electromagnetic Interference (EMI) in modern power electronics and power systems, which can help engineers and students to analyze EMI problems in electrical and electronic systems. This E-Book focuses on conducted and radiated emission noise generated by different power converters such as Switch Mode power Supplies and DC-AC Inverters. EMI filter design and different approaches to predict common mode and differential mode noise are illustrated in detail. One of the challenging issues in power converters is thermal problem due to heat generated by switching devices; the effects of heatsink on conducted and radiated noise have been taken into account. Common mode and surge voltage issues in AC machines have also been addressed and discussed in this E-book. 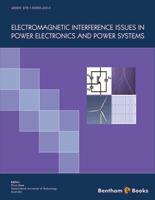 This E-book consists of five chapters which address different EMI issues in power electronics and power systems. The chapters of this E-Book were written by eminent researchers and engineers and I would like to thank all the authors for their time and contributions.